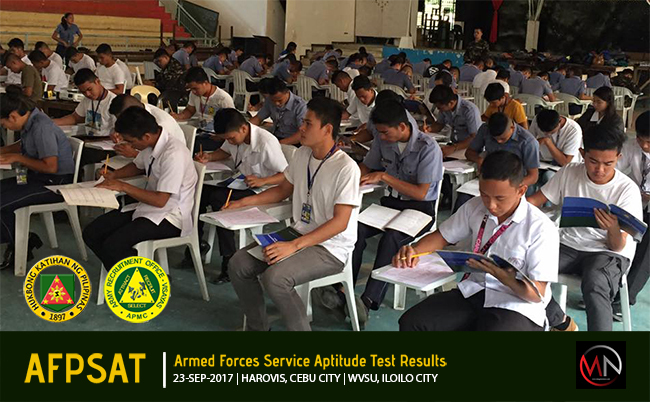 September 23, 2017 AFPSAT Results for Cebu and Iloilo - AROVIS - Exam News, Reviewer, Military Career, & Everything [MN] . . The Army Recruitment Office of Visayas (AROVIS) has released the results of the Armed Forces of the Philippines Aptitude (AFPSAT) conducted at HAROVIS Cebu city and Western Visayas State University (WVSU), Iloilo City last September 23 simultaneously. The announcement of results was posted at AROVIS Facebook page a week ago.